“My daughter used to be very prone to diaper rash. I discovered Triple Paste, and that’s now my go-to cream,” says Shilpa Amin-Shah, MD, a mom of a son and two daughters and an emergency medicine physician at Emergency Medical Associates, in St. Johns, FL. 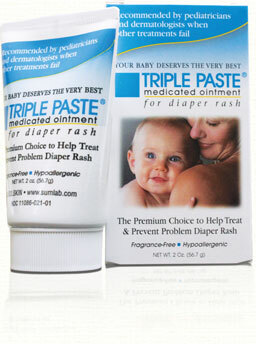 When your toddler’s behind is looking rosy more often than not, try soothing it with Triple Paste. It’s a prescription-strength diaper rash cream that’s gentle enough to use every day. Two ounces cost $10, and you can buy it at drugstores. For more information, visit TriplePaste.com. Note: We received sample(s) of Triple Paste in exchange for our honest opinions. Regardless, we only recommend products or services we use personally and believe will be good for our readers. Triple Paste is a paying partner of Momosa Publishing LLC. Regardless of whether we receive compensation from a vendor, we only recommend products or services that we have used personally and that we believe will be good for our readers.